Lots of sunshine. High 68F. Winds WNW at 10 to 15 mph.. 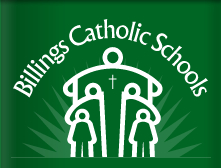 The mission of the Billings Catholic Schools is to provide a quality Catholic education that emphasizes formation in faith, spirit, academic excellence and service, justice and peace.